The Content Marketing Institute (CMI) and MarketingProfs recently released their latest joint study on the use of content in the marketing mix: B2C Content Marketing, 2015 Benchmarks, Budgets and Trends—North America. While many of the findings are predictable—the most successful content marketers have a documented strategy—there are certainly some surprises. 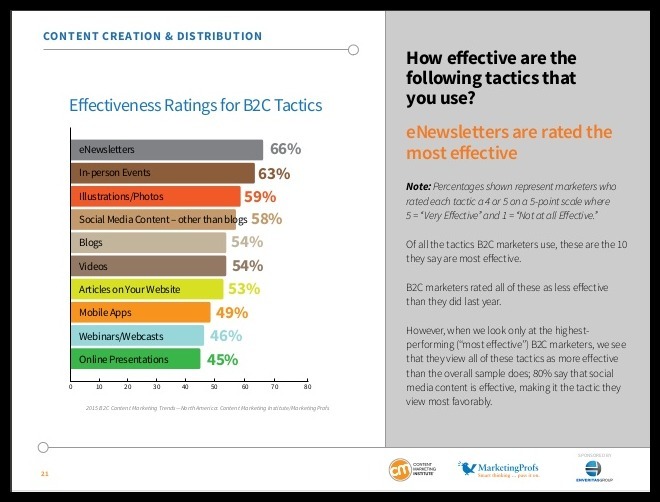 According to the research, 66% of business-to-consumer (B2C) marketers rank e-newsletters as the most effective content marketing tactic . . . even more effective than in-person meetings (63%), social media content (58%) and blogs (54%). Email marketing clearly deserves to be near the top of the list. When used with an opt-in list and following other best practices, email marketing is powerful—a kind of social media platform on steroids. Its ability to regularly reach a large number of loyal subscribers makes it more efficient than trade shows or other types of face-to-face encounters. And despite all the hype about social media and blogging, marketers recognize the power of a targeted and tailored email campaign to communicate their message and tell their story. 1: Who’s using content marketing? Content marketing isn’t just for business-to-business (B2B) marketers. 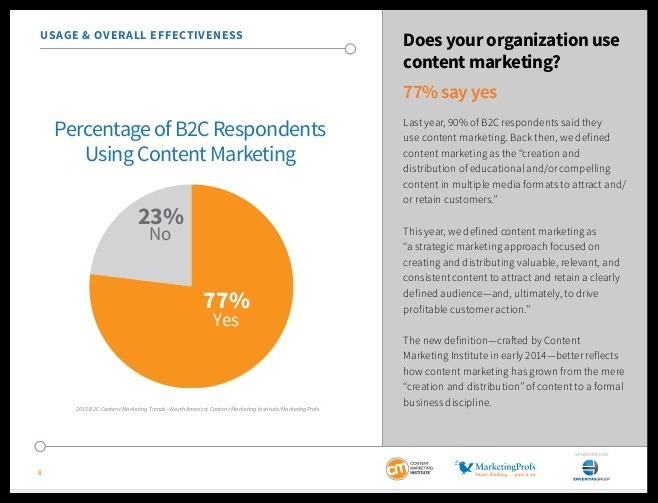 B2C companies are also embracing it, with more than ¾ of those surveyed (77%) using content to build their business. 2: Why are organizations using content marketing? B2C marketers reveal a variety of organizational goals for their content marketing efforts, including building customer retention, customer engagement and brand awareness. The study asked respondents to rate how important each goal is on a scale of 1 to 5 (5 being “very important” and a 1 “not at all important”). 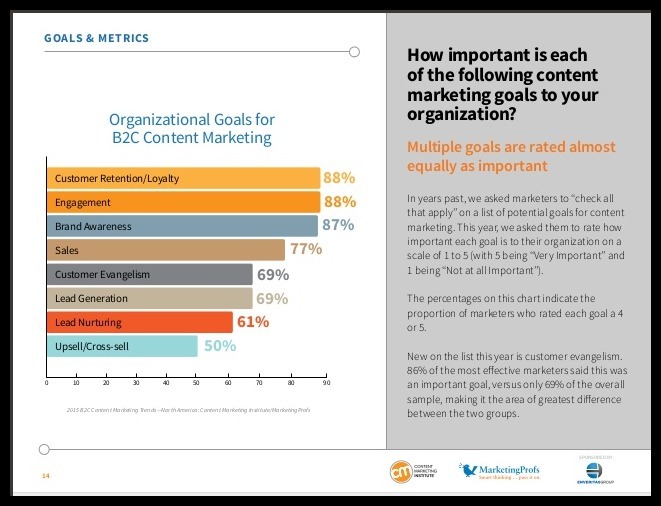 The percentages on the following chart indicate the proportion of marketers who rated each goal a 4 or a 5. 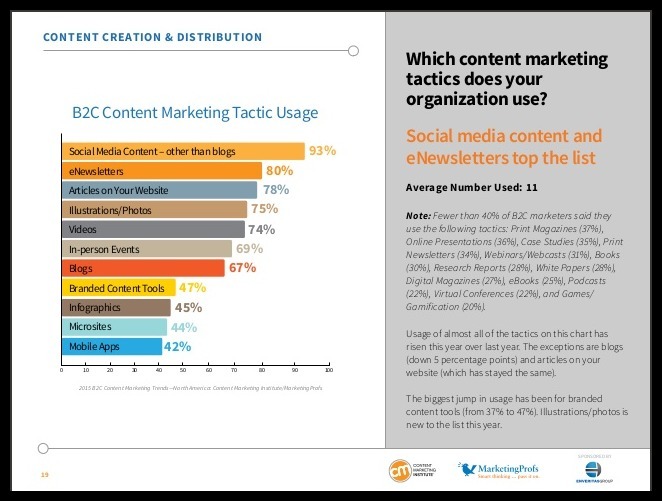 3: What content marketing tactics are they using? You may be surprised by the different ways that marketers are using content marketing. I certainly was. 4: Who’s using content marketing effectively? 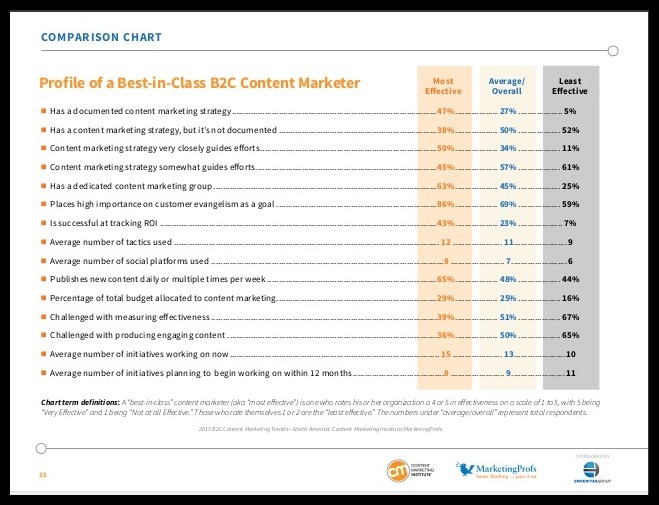 Best-in-class content marketers (i.e., those who rate their organizations as a 4 or 5 in effectiveness on a scale of 1 to 5, where 5 is “very effective” and 1 is “not at all effective”) are more likely to have either a documented or verbal content marketing strategy and to use the strategy to closely guide their efforts. They also tend to have a dedicated content marketing group and place high importance on customer evangelism. 5: How are marketers measuring content marketing success? Survey respondents cited website traffic, sales and conversion rates as the top 3 metrics used to measure content marketing effectiveness. 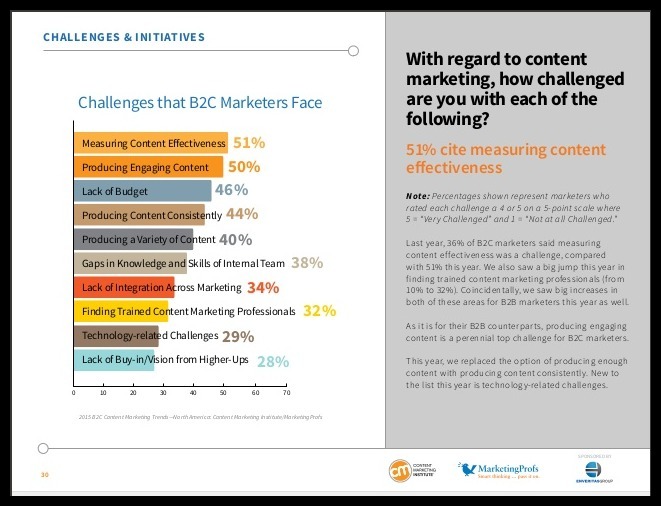 6: What challenges do B2C content marketers face? Measuring content effectiveness is the biggest challenge B2C marketers are facing (cited by 51% of survey respondents), closely followed by the challenge of producing engaging content (50%) and budget constraints (46%). Content marketing is not a passing trend. More and more marketers—both B2B and B2C—are embracing the discipline to tell their story, engage their customers and build their business. It’s not necessarily an easy task. Content marketing is hard—especially for resource-strapped marketing departments. Yet organizations that have a dedicated content marketing team and a documented strategy that follow best practices will reap the rewards. Sure, many content marketers still struggle with measuring ROI. But as the discipline evolves and new best practices emerge and take hold, we’ll see more content marketing that not only tells compelling stories, but also helps build leading brands. If you need help developing a content marketing strategy, get in touch to learn more. 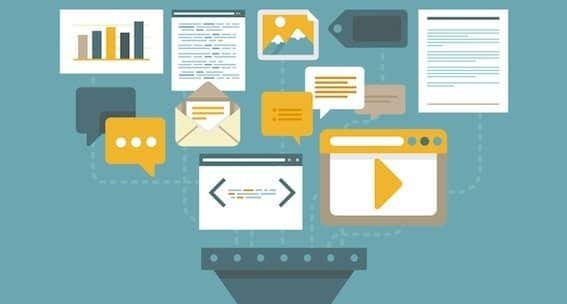 About the study: B2C Content Marketing: 2015 Benchmarks, Budgets and Trends—North America reports findings gathered from the fifth annual content marketing survey conducted by the Content Marketing Institute and MarketingProfs, and sponsored by EnVeritas Group. It includes findings from 307 North American business-to-consumer (B2C) marketers from among 5,000+ marketers surveyed across 109 countries and 25 industries. This article originally appeared on the Polaris Marketing & PR blog, and was licensed through Business2Community.